For today’s video, Misty Weaver from the Dream Weaver Real Estate Team, is going to talk some about Zillow and the pre-foreclosure properties that you may have seen listed on their website on occasion. We get frequent calls about these and today’s video will discuss whether or not you can actually purchase them and the process involved in doing so. The transcript of the video is just below the video itself if you’re interested in reading the write-up. Hey, everyone, come join me! We are going to talk about Zillow and pre-foreclosures that you may see listed on their website. So I’m going to give you a quick market update and we’ll get into that. I have a lot of people that call me about these listings, so I want to go over exactly what it means; can you actually buy them; and the whole process. So first, right now in the last seven days in Winchester we have seen 32 homes come on the market. That’s down just a little bit. We’ve seen 14 come back on the market, which means they were either under contract and that fell out or they were temporarily taken off for some reason and then came back on the market. But the big news is that we have seen 39 homes with a price decrease. So that’s higher than the new listings, so that is giving you a little idea of what the market is like right now. We are seeing a lot slower sales times and we’re seeing prices drop because of that. So I think we’re going to see a lot more of that, especially as we get nearer to the holidays. And then we had I think 15 go off market. They didn’t sell. The owners just took them off, they’re not selling them anymore. So we’re going to start seeing a lot of that. A lot of people think that they don’t want to want to sell over the holidays; they don’t want people coming through, so we’ll see that. So they may come back on in early spring. So let’s get into Zillow. First caveat, if you are looking for a house, I would suggest you not use Zillow. And the whole reason we’re having this discussion is one of the reasons. So pre-foreclosure. Let’s talk about the foreclosure process. Essentially Virginia is a non-judicial foreclosure proceeding state. So they don’t have to go to court and have a judge say that, yes, you can foreclose. They basically have to file and follow an outline of steps, which the first thing is a notice of default, which you will also hear called a NOD, N-O-D. Notice of default. And it is essentially, hey, your mortgage company, we know that you’re behind and you’re so far behind that we can foreclose on you, and we’re going to do that at this date… so you have so many days to either catch up on the payments, call us, work out a plan, do something so that we do not foreclose on you. And they do what is called an auction off the courthouse steps. Not technically “on” the courthouse steps, but that’s what it’s called. But you do go to the courthouse and there will be someone there, a representative from the bank, and then there may be investors; there may be just people that want to kind of see the process. But you have the opportunity to bid on the house that is up for auction. Now, just because someone got that letter, it doesn’t mean that they’re going to be foreclosed. If they work a payment plan out or they catch up, that’s not going to happen. So what you see on Zillow is this house is in pre-foreclosure. Most people think they just see foreclosure and they think the house has been foreclosed on, and now I can buy it. So what happens at that point is I get a call or someone sends me, hey, my friend wants to buy this house. And I look it up. And it’s not for sale in the MLS. It’s not listed anywhere other than Zillow. So then I have an app I can go to and I can see things that have been filed at the courthouse and I see there is a NOD that’s been filed and there is an auction date set. A lot of times I can see past ones, so a lot of the properties I will see that, oh, they’ve actually gotten a notice of default several times over the past several years, so it looks like they’ve had some financial issues. They get behind and then they catch it up. So at that point you can do a couple of things, none of them are super-fun. You can go knock on the door and see, hey, I saw that you’re behind on your mortgage. It’s probably not going to be a great reception by that family. If they are having financial issues, they don’t want someone knocking on their door. They don’t want their neighbors to know. And most likelyy they want to stay in their home. They own it. They love it. They live there. So it’s going to be very uncomfortable, but you can do that. Now, to buy it from them at that point you would essentially have to do a short-sale, if you wanted to negotiate the price, or you would have to pay-off their mortgage. And that mortgage could be anything. If they bought it several years ago, it could still be fairly high. If they’ve lived there for 50 years, obviously it would be a lot lower. So let’s say they don’t catch it up and it goes to actual auction. So now you can go and buy it at that auction. And what that looks like is, like I said, there’s going to be a representative from the bank there, and they want to get the money back that they paid for this house. They did the mortgage. Let’s say it was a few years ago, and so they did several-hundred-thousand-dollar mortgage. The bank gets to control what they will accept from another bidder. So they will bid on their own home, but you can buy it from them. Most of the time they want all of the mortgage back and they want all of the fees that they’ve had to pay to do the foreclosure proceedings. So they had to file all of the paperwork. In Virginia they have to do a ton of newspaper advertising, up to five times. There’s a whole process, so they have money into that. So they want that money back. Most people think “foreclosure,” I’m going to go in and I’m going to get this huge deal. I’m going to go to the steps of the courthouse and I’m going to pay $50,000 for a $300,000 house. That’s not going to happen. The bank still needs to get their money back and basically they want market value! So let’s say you go to the courthouse steps and the bank takes it back. What happens at that point? Now, it is kind of sitting with all of the other assets of the bank and the banki has to determine when they are going to sell it, and that is when you will see it come onto the MLS. If it goes into public. 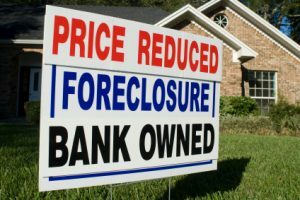 Sometimes they sell packages of foreclosed homes to larger investors, so you may never see it come back on the market because some big investor buys it and they decide to rent it out or whatever, so you may not see it. But the timeline for that is the big thing. So I have seen the properties come back on the market as soon as six months. And I’ve seen it take eight years. So it’s really up to them. They have their own plan and we really don’t know that. Sometimes you can contact the bank and make an offer directly to them. That’s often very difficult to find the right person. They’re not invested. They’ve never even seen the house in most cases, so they don’t have a mortgage to pay. They’re not a normal owner, so you can’t kind of bully them. So those are kind of your options, but the big thing to know is that Zillow and pre-foreclosures, they are not homes that are for sale that you can go in, have your realtor make an offer on it. You have to go to the courthouse steps and bid against the bank in order to get that property before it goes to foreclosure. Okay? Or you have to go knock on that home and talk to the owner and make a deal with them to buy the house, and like i said, that is usually going to be a short-sale. It might not be. So the other thing to know is that if you are buying on the courthouse steps, you are probably not going to be able to get into that house to look at it. So you can do a drive-by, kind of see the outside. Has it been kept up? Is there delayed maintenance? What’s going on? But you’re not going to be able to see the inside, and if you can imagine losing your home, a lot of people get very upset and they destroy the home. So you really need to know the market and what you can pay, what you are comfortable paying, and what makes sense depending on what you’re going to do with the house. If you are planning to live in it, you might be able to do, pay more than if you were planning to flip it and sell it or fix it up and rent it out. So all of those scenarios are going to have different budgets, so you really need to know your final plan, what you’re going to do with it, how that’s going to look financially so that you can have your maximum bid. And a lot of times because the bank wants their mortgage back, plus all of the fees that they’ve paid for the foreclosure, that bid that they are going to accept on the courthouse steps makes zero sense for someone else to buy it, so the bank is just going to do a hundred-dollar bid and they’re going to get it. So you’ll see transactions like that, it will be $100. Well, that doesn’t mean that you could go in there and get it for $150. There was a minimum bid that someone else other than the bank had to do in order to get that property. So what should you do if you see a pre-foreclosure on Zillow? Talk to your agent. 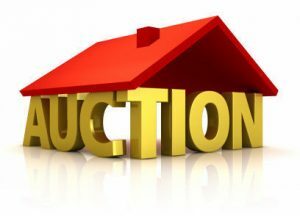 If you are thinking about becoming an investor and doing all of that, there are a lot of groups around, so you can go and start learning about buying at the courthouse for foreclosure auctions. Or you can learn the other ways of doing investing. So if you look at the MLS for foreclosures, that’s hard to say “for foreclosures,” they will be typically titled REOs in our area. So you want see the title “Foreclosure” very often. You will see REO. So you can go and search for those. And those are actually in the MLS that you can buy right now. And if you are a first-time investor or you are buying for your home to live in, that’s typically the much easier way to go. You don’t have a huge learning curve and you’re not competing against a bunch of other seasoned investors who do this all of the time and they really know the market and what they can bid and how the process works. So there you have it. Like I said in the beginning, if you are searching for a home, I really, really recommend you do not use Zillow. Go to realtor.com, use our website, dreamweaverteam.com. They are both updated with the MLS, the actual homes that are there for sale and still available. You will also find stuff on Zillow that has not been updated, so it has already been sold, even if it was on the MLS. I get requests to see homes all the time that are already under contract or resold, sometimes years ago. But they are still listed on Zillow. So I recommend going to those websites instead. If you have any questions, if you are thinking about becoming an investor, please reach out. We work with a lot of investors and we can kind of give you the rundown, figure out what your goals are, and go from there to find you the best properties. So let me know if you have any questions about Zillow or anything else! Thanks, guys!